To dispel the idea that organic food is expensive, the Organic Trade Board has launched the #ThriftyOrganic challenge, aiming to prove that everyone can go organic without breaking the bank. And their challenge to me was to cook an organic, three-course, family supper for less than £30. I was extremely curious to see how manageable this might be, so I accepted. When planning our meal, it did of course occur to me that I could save myself a packet by omitting meat from the menu. We don’t eat meat every day, after all. We’re an example of that latest phenomenon, the ‘flexitarian’. No, it’s not my favourite trendy moniker either. But as we do really enjoy our meat, it only seemed a fair challenge to me if organic meat was included. The important thing when you’re being a #ThriftyOrganic is to really value your meat and make it go as far as you can. Paying a tenner for an organic chicken may sound like an unaffordable luxury to many. But that’s exactly what I did for this challenge, and I made that chicken go as far as I possibly could. For the main course I decided to make a risotto. That way I could roast the chicken for lunch on the Saturday and use both the carcass to make a stock and the leftover meat for the risotto the next day. It was a decent sized chicken, and there were enough leftovers to make the children chicken sandwiches for their packed lunches on Monday, as well as a chicken salad on Monday evening for my main 5:2 fast day meal. So yes, the organic chicken cost £10.49 but it did provide for four separate meals. I’d say that’s pretty good value. For our three-course supper to feed four people, I decided to make homemade organic cheesy garlic bread for the starter, served with big, fat, organic Kalamata olives, followed by the organic chicken risotto (which also made the most of leftover roast butternut squash from our Saturday lunch) and a simple salad (organic tomatoes and cucumber, with some spinach leaves from the garden). For dessert I decided to try my hand at panna cotta, made with organic cream, organic milk and topped with organic raspberries. Oh, and flavoured with organic Kromland Farm raspberry rooibos. The idea was to go simple and wholesome, and, despite one near disaster with the pud, I’m pleased to report the supper was a success and the family cleared their plates greedily. I planned my meal first, then shopped for the ingredients. That’s how I usually do things. Every week I work out a seven-day meal plan and then order my shop online from Sainsbury’s around that. I just kind of assumed it would be a simple case of swapping the key ingredients for organic versions. However, that’s when I discovered it was not possible to buy organic alternatives online from Sainsbury’s for everything I required. I couldn’t get organic bread flour for instance. Nor organic double cream. Nor organic salad leaves. But that’s OK, I thought. I need to go into Frome on Friday evening, so I’ll pick those items up from the health food shop instead. The health food shop did stock organic bread flour, so the garlic bread was a goer. But sadly, no organic cream or salad leaves. Now if I’d been getting a weekly veg box from Riverford that week, it wouldn’t have been a problem. I could have added those to my usual weekly order. However, I’m not getting a veg box at the moment, as we have so much of our veg in the garden to get through. So the salad leaves would have to come from the garden – I’m counting those as organic as we haven’t used any chemicals on them at all. But the lack of cream was a bit of an issue. I did find a carton of organic oat substitute for cream from Oatly in the health food shop, so decided to improvise with that instead. That, sadly, I think was the downfall for my panna cotta. Although I can’t honestly say, hand on heart, it was the fault of the oat substitute that my panna cotta wouldn’t set, as I’ve never actually made panna cotta before. It does usually pay to test out a recipe first with the right ingredients before experimenting with different ones after all. Anyway, the dessert was absolutely delicious, although I’m not sure it could accurate be described as a panna cotta. Maybe more a syllabub or posset? I wasn’t all that bothered though since my family loved it, and asked me to always make it ‘wrong’ in future. With a budget of £30, that might look like a rather large overspend. However, several of the items bought were used in additional meals and many are still in the cupboard continuing to be used. I learned that eating organic isn’t as expensive as you might expect. Our three-courses ended up costing half the allocated budget, which was a total surprise. I know that was the point of the whole exercise, but I really thought it would be a lot tighter. However, I still had to part with considerably more than the budget – the initial outlay was nearer the £40 mark. Although that does now mean I have a good stock of organic ingredients in the kitchen cupboard. So the other lesson is that you really need to make the most of your organic ingredients if you’re going to get your money’s worth, making things from scratch where you can. Instead of buying organic bread, I baked my own. From that bag of flour, which probably cost the same as a single loaf, I’ll be able to bake another five. It also really pays to plan your meals ahead in order to make full use of your shopping basket. And if you’re trying to go completely organic, you’ll find you’ll need to shop around, as it’s unlikely your local supermarket will have organic alternatives for everything you might want. Or was that just Sainsbury’s online? I now need to investigate other supermarkets. I’ve heard both Ocado and Lidl have good organic ranges. All this of course takes time, which isn’t a luxury many of us have. You need time to both plan and shop, but if time is on your side then it is perfectly possible to switch to organic without having to take out a second mortgage. In addition to our organic veg box, I’m definitely going to be introducing more organic products into our weekly shop in future – meat, in particular. But that was just one meal. How easy would it be to go organic for a whole week? Check out these posts from The Hedge Combers, Feeding Boys and a Firefighter, English Mum, and Utterly Scrummy Food for Families to see how they got on going organic for seven days. 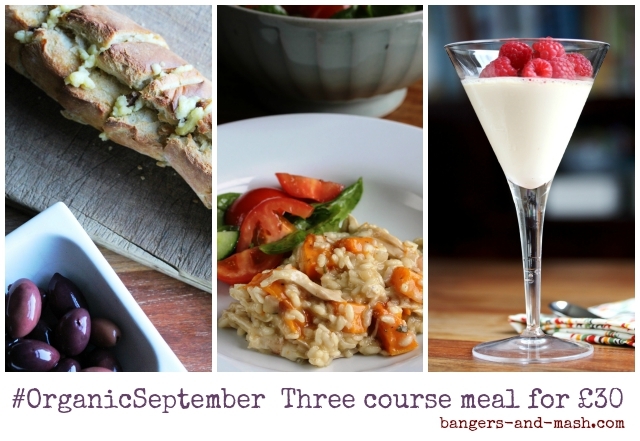 So here are the recipes for the cheesy garlic bread, risotto with chicken and butternut squash, and raspberry rooibos panna cotta (of sorts). Place the flour, salt, yeast, olive oil and half of the water in a large bowl and bring it together with your hands. Gradually add more water until it forms a dough. Lightly flour your work surface and knead the dough for five to ten minutes until the dough is smooth. Lightly oil a clean bowl. Place the dough in it, cover with clingfilm and leave in a warm place to prove for a couple of hours. Knock back the dough, tip out onto a floured surface and divide in two. 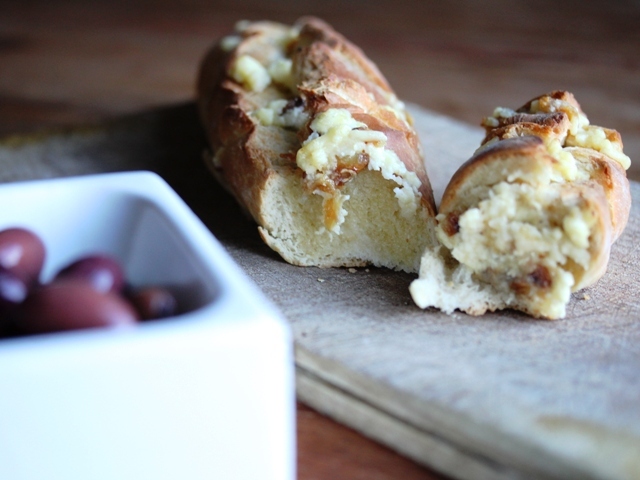 Stretch and fold the dough and roll into two baguette shapes. Place on a baking sheet, cover and leave to prove until the baguettes have doubled in size. Meanwhile, prepare the garlic filling. Break up the head of garlic and place the cloves (still in their skins) in a roasting tin. Drizzle with a little olive oil. Cook for 20 minutes until caramelised. Remove from the oven and leave to cool. Squeeze the soft garlic out of their skins into a bowl. Grate the cheese and add this to the bowl, along with a little more olive oil. Mush it all together with a fork until well combined. When the baguettes have doubled in size, preheat the oven to 220°C / gas mark 7. Place a roasting pan of hot water in the bottom of oven to create steam. This will help the bread form a good crust. Slash the top of each baguette three or four times and place in the oven. Bake for 30 minutes. Remove from the oven and leave to cool. Again preheat the oven to 220°C / gas mark 7. Cut slices into the baguettes (not quite all the way through) and smear with the cheesy garlic mixture. Bake in the oven for five to ten minutes until the cheese has melted. Heat the olive oil in a large pan and gently cook the onion for around 10 minutes until translucent. Add the garlic, sage and rice and fry for another couple of minutes. As the last ladleful goes in, throw in the chicken and squash and stir together for two to three minutes. Add salt and pepper to taste. Place the gelatine leaves into a small dish, cover with cold water and leave to soften. Pour the Creamy Oat and milk into a saucepan and mix in the caster sugar. Set over a low heat and gently bring to the boil. When it is just beginning to bubble, remove from the heat and stir in the vanilla extract. Pour a cupful of the mixture into a jug. Remove the gelatine leaves from the dish, squeezing out as much water as you can. Put the gelatine into the jug and whisk into the sweet creamy mixture. When the gelatine has completely dissolved, pour the mixture into the jug back into the saucepan and whisk it all together. Pop the raspberry rooibos teabag into the mixture and leave it to steep for a few minutes, before giving it a good squeeze and removing. 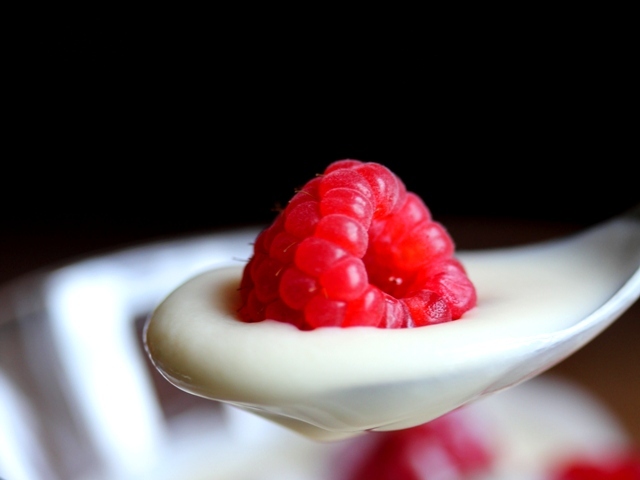 Pour into four moulds (such as dariole moulds) or into glasses as I did – that way it’s not a problem if your panna cotta doesn’t completely set, and you can pretend you actually intended set out to make syllabub right from the start! Carefully move to the fridge and leave for at least six hours or ideally overnight. Serve simply garnished with fresh raspberries. Is it important to you to shop organic? 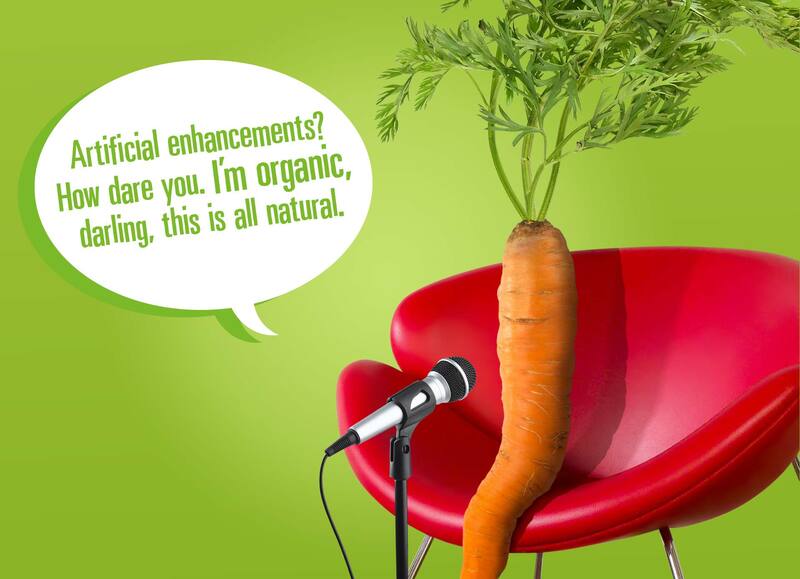 What organic ingredients do you buy? Where do you shop for organic food? What’s your favourite organic product? Have you taken part in the #ThriftyOrganic challenge this month? If so, feel free to share a link to your post below! Disclosure: The Organic Trade Board provided me with shopping voucher in order to take part in this challenge and develop recipes. As ever all opinions are my own.